My office had a lady who lived in Wisconsin. She handled about 90% of our Wisconsin business. But, she was only part time, even though there were weeks when she was working as much as the rest of us, and she wanted full-time. So, she left us September 1st for a full-time job. What that means is that the jobs she would have normally handled have to be handled by those of us in the Chicagoland office. Generally, we do more inspections in Wisconsin over a wider variety of smaller projects, than we do active on-site work. "Deb, you're the best inspector in this office." Where am I going this week? Last week, I found myself up near Fond du Lac. I got my maps and directions and set off. I got to just south of Fond du Lac on Interstate 41 and made a right onto US Highway 151. Wait. What? See? 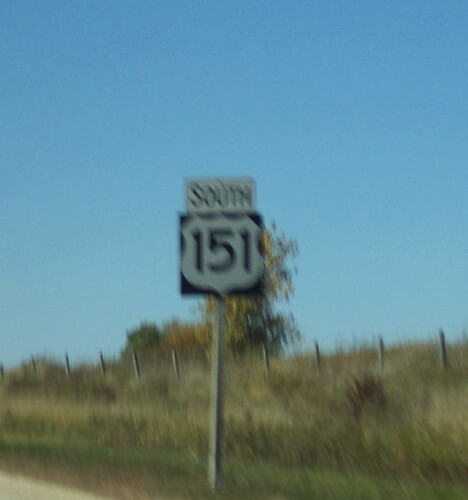 I was on US 151. Why should that matter? Well, when I go to Iowa, one of the routes I can use to get to mom's involves driving a chunk of 151 from Anamosa to Marion. It had never occurred to me that 151 began or ended somewhere. It doesn't have a song about it like Route 66 does. It's not considered the "arterial of the nation", as Interstate 80 is sometimes called. It's just US Highway 151. I know this number. That got me looking on Google for where this road begins and ends. It begins in Manitowoc, Wisconsin. To the right is Lake Michigan. 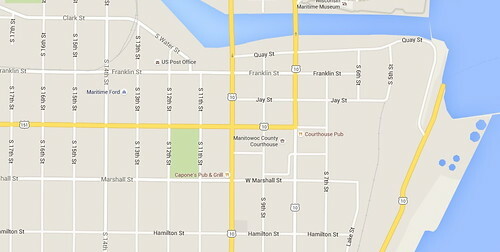 US Highway 10 is running north and south through the downtown and 151 heads west. It heads diagonally southwest through the mid-section of Wisconsin, passing Fond du Lac and Madison before exiting Wisconsin and entering Iowa at Dubuque. Once in Iowa, it goes southwest from Dubuque past Anamosa and Marion and the Amana Colonies before ending at Interstate 80 east of Williamsburg. I've been on quite a bit of this road. It runs past Dickeyville, Wisconsin and I was there before my Memorial Day vacation to see Patt. I remember when we had to do on-site work when the state of Iowa widened 151 from 2 lanes to 4 and the road wound up passing close to some homes. I remember driving on sections of 151 when my parents lived in Marquette, Iowa and getting from Wheaton to Marquette was fastest taking the Interstate to Madison and then going west. Google says the route can be driven in 6 hours. I'm tempted. I would not make it a very long day. I would drive up to Manitowoc, a place I don't think I've been, and stay overnight. In the morning, I would begin a leisurely drive southwest, stopping along the way at the historical markers and interesting places along the route. I haven't been to the grotto in Dickeyville since I was in middle school. I didn't go in May; there wasn't time. I drove by it and it didn't look all that different from what I remembered. Dubuque is worth a couple hours. They have the National Mississippi River Museum. I watched that being built but have yet to go there. All these years of knowing the Mississippi and I've never been to the museum. And, at the southern end are the Amana Colonies. They are worth driving there just for the history and the preservation of a way of life. It's another place I haven't been to in a very long time. For the modern world to crash down upon your senses, you drive a few miles west and go to the outlet mall. Once I get into Iowa, I have a ready made B&B a few miles north of 151, in Walker. Oh yes, this has potential. I think about road trips I'd like to do. I would like to fill in the drive on Interstate 80 from New Jersey east to where it ends in New York City and drive west from Reno, Nevada to where it ends in San Francisco. I've driven all the rest of I-80. I grew up along the Mississippi and am very familiar with the signs indicating a "Great River Road". I've driven all facets of that route from its beginnings at Lake Itasca in Minnesota to Keokuk, Iowa. Back in the 1970's, we took a 2-week family road trip and drove a large loop through the south, coming north from Louisiana to St. Louis before going inland and going due north to home. Some of that was on small sections of the Great River Road but we were tired at that point and Interstate was the fastest route home. A Great River Road Trip would be more than a week's worth of driving. 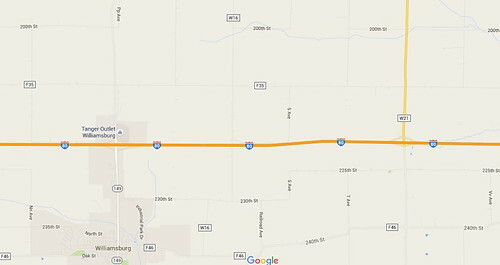 There would be so much to see along the route and much of it is NOT interstate. As I look ahead, briefly; gotta get through BlizzCon; to vacations in the next year, the idea of a few days spent following a road through a section of country I know reasonably well, is very appealing. I'm willing to wager you've never really looked at the numbered highways that go through your neck of the woods. Where do they begin and end? What kind of excitement would be along the way? I think I may find out.